What is a bridal portrait? Well, it can be a formal portrait in a studio with exquisite lighting, or it could be taken in a church or synagogue, or it’s always fun to get out into nature and find just the right setting. Today I thought a waterfall might be nice. Just to let you know, getting to these spots can be a bit tricky. For this particular shot Mary, our Extreme Model, and 2 photographers scaled down the side of a pretty steep embankment to get to a place where we could get the shot. Mary had her dress in a backpack along with the veil and flowers. We tied a rope to a pillar at the top of the embankment to make sure we could steady ourselves on the way down and have a way to pull ourselves back up. Nevertheless, we made the trip to get to the spot to get the fantastic shot. It’s just part of who we are and what we do as artistic photographers in the Smoky Mountains! Here’s another shot of Mary taken from a much more reasonable and easily accessed spot. Not quite as dramatic, but it also didn’t require repelling. If you’re considering having a bridal portrait in the mountains made, the best thing to do is give us a call or make an appointment to discuss the options. Tell us about your comfort levels, tell us about you and what type of portrait you’d like. Ultimately this is a moment in time that showcases you, your dress and a glimpse of who you are by the choice of the surroundings you’ve chosen for your portrait. This will become a family heirloom, and if taken in the right time frame, could be a gorgeous framed print or canvas to show off at your wedding! 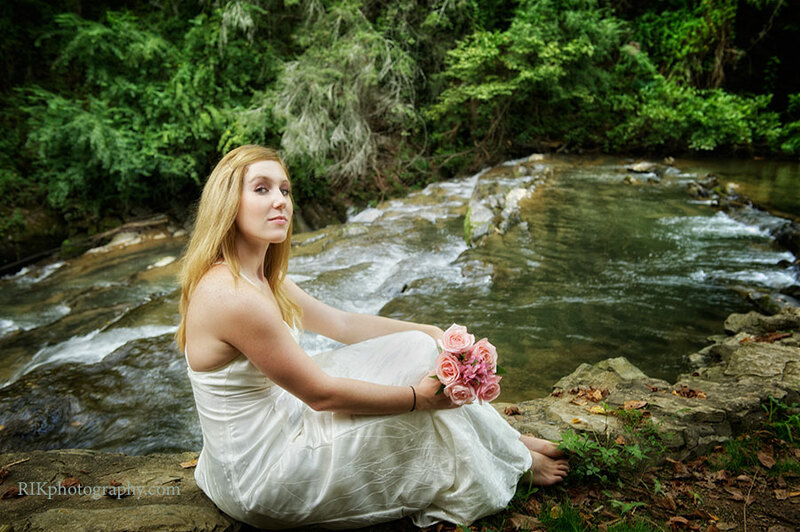 artistic photography, smoky mountain photographer for weddings and receptions. Family portraits in the smoky mountains.